The impression given by the Bible that Cyrus made a special decree allowing the Jews to return to their homeland. 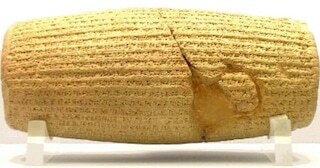 The discovery of the Cyrus Cylinder allows us to put that decree in its historical context. Rebuilding is usually harder than original construction, whether it’s a coach rebuilding a team, a family rebuilding a home, a couple rebuilding a marriage, or a prodigal rebuilding a life. But whatever we’re rebuilding we have a blueprint for it in the book of Ezra. Years after the Jewish people had been defeated and dispersed by their enemies, a group of Jews, in three waves over a period of about a hundred years, returned to their ancestral homeland to rebuild their nation. It was a tough trip. Their once-glorious temple was in total ruin and the wall around the city was rubble. Nehemiah tells how they rebuilt the walls. Ezra falls into two sections that cover the first and second returns of these exiles. 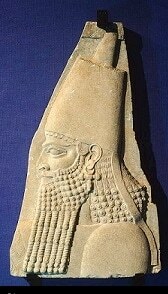 Sargon II, one of fifty Hebrew Bible figures identified in the archaeological records of Ezra. Chapters 1-6 describe the first group of returnees and the rebuilding of the temple. Chapters 7-10 cover the second return and the ministry of the teacher Ezra, who taught the people God’s Word and stressed the importance of remaining separate from the world. The book of Ezra teaches us to seek the Lord in prayer, submit to His Word, and acknowledge His wisdom, power, presence, and love. The rubble may not be cleared away in a day or a year, but when we put first things first, the rest of life will come back into alignment. Begin with the altar – with worship – and restoration will follow. In showing how the returning exiles rebuilt their temple, city, and nation, Ezra teaches us to rebuild areas in our lives that have been damaged or defeated. “Then I proclaimed a fast there, at the river of Ahava, that we might afflict ourselves before our God, to seek of him a right way for us, and for our little ones, and for all our substance” (Ezra 8:21). In rebuilding anything, we must start with the altar – reestablishing the Cross of Jesus Chris as central to our lives and activities.